GoldBrick was one of the many freaks that lived underground under the leadership of Rock. He was present when WildStar unwittingly took control of the group after a misunderstanding where he accidentally knocked out Rock. The Chicago Police Department came to evict the community and GoldBrick was one of those that fended off the authorities during a brief fight. When Dragon was invited by the government to form his own team of heroes, he sought out the Underground Freaks for potential members. 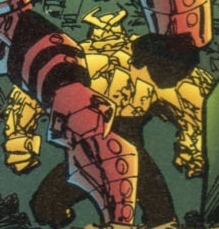 GoldBrick accompanied him to enlist but on one of the earlier missions, he and two teammates tried to arrest Rogue Warrior. The fight was interrupted by Kill-Cat whose actions caused the deaths of GoldBrick, Crusher and Morose at the hands of the villain.